I’ve been using the J5 Tactical flashlight as a “walking light” on our walks around the neighborhood, because its bright white spot has definitely caused a few drivers to look up from their phones at the last moment and swerve away. It looks like they’re depending on the “gold” in cutaway plated-through holes to make electrical contact with the aluminum mount, then through the threads to the case. The PCB joint would work much better with consistent pressure all the way around its perimeter. I mashed the PCB into place with a machinists vise, but, given the number of problems I’ve had with J5 flashlights (one a QC reject), they’re on my Non-Preferred Vendor list; if I’m going to get junk, I may as well pay bottom dollar. 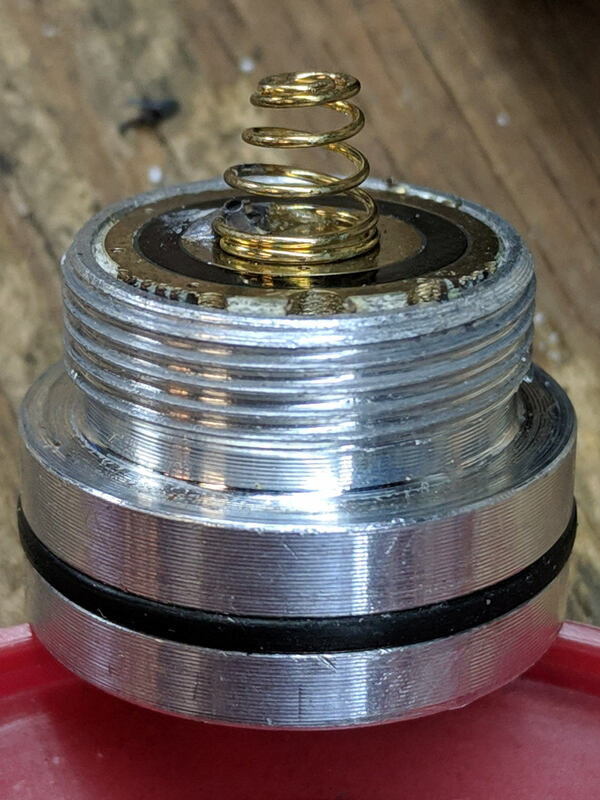 This entry was posted on 2019-02-25, 07:32 and is filed under Electronics Workbench, Home Ec, Machine Shop. You can follow any responses to this entry through RSS 2.0. You can leave a response, or trackback from your own site. I have a 1st generation Mini-Maglite (4 mode* LED) that I’ve been using daily a few years now. It’s reliable and battery life is good on the dim-steady mode. We have the 2nd generation Mini-Mags in various places; Julie has one in the sewing area and one or two are in vehicles. These are on-off, and are at least as good as the incandescent ones. I’m trying a Dorcy min-mag clone. Clicky pushbutton switch in back (no provision for a quick blip of light, though) and a slide on the lens for spot vs flood. Decent price. It’s a few months old. (*) Bright (default on powerup), Medium, Bright blinky, Bright SOS blinky. Overkill, IMHO, but the bright/dim option is nice. I prefer having the switch under my thumb, but that requires a much bigger body and doesn’t work well with small lights. Price of progress, I suppose. I’ve always wanted an eye on a stalk, but hadn’t realized the benefits of a ring light around it! Failure point on my Chines cheapo seems to be the endcap button or more specifically contact surfaces inside the button. So far I’ve replaced two in about 8 years. You (and I!) hate to throw out something just because one part failed, but a standard, replaceable switch would probably double the cost of the flashlight. I don’t know what the right answer is, but I’d try bending a few tabs in those switches to see what happened. Practice may not make “perfect”, but it certainly gives you the confidence to work on nearly anything in need of fixing! Then combine all the bits into something different!